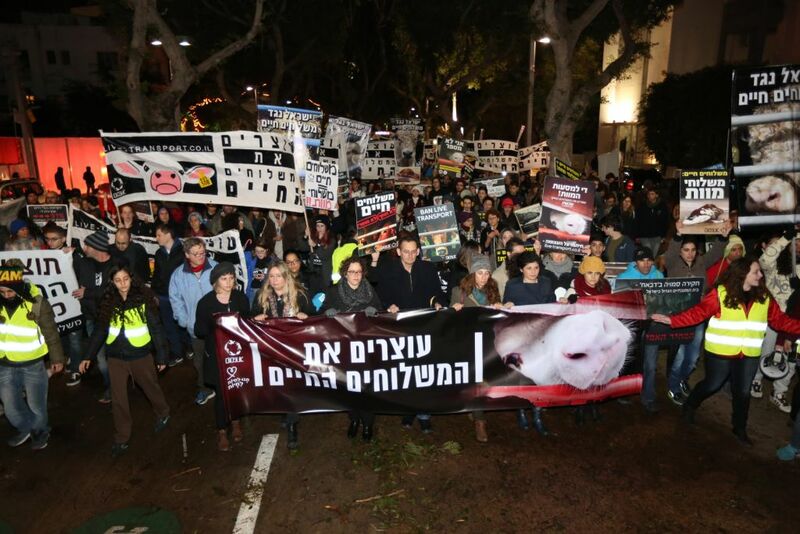 An estimated 2,500 Israelis braved unusually cold weather in Tel Aviv Saturday night to send a message to the agriculture minister, the country’s two biggest meat companies and the Supreme Court: Stop shipping live animals to Israel for slaughter. On Wednesday, Supreme Court justices will discuss a petition against live shipments lodged in November 2015 by the animal rights groups Anonymous and Let the Animals Live. It is not known whether they will reach an immediate decision. In 2016, 571,972 heads of sheep and cattle arrived at Israeli ports from Europe and Australia – nearly double the number for 2015 (292,274), according to Agriculture Ministry figures. More than 30 percent came from Australia – the biggest live animal exporter in the world — on journeys that take up to three weeks, with the remainder arriving from Eastern Europe and Portugal. Ships resembling multi-story parking lots carry from 1,000 to 20,000 cattle, or 100,000 sheep, or a combination. Once in Israel, the animals are loaded onto trucks for journeys that can take hours to slaughterhouses or to pre-slaughter fattening facilities. 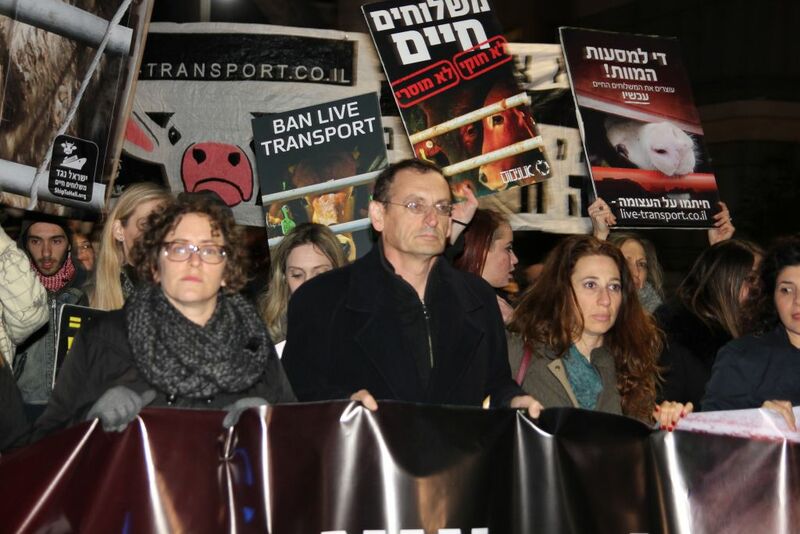 At the rally, actress and animal activist Yarden Segal read excerpts from the testimony of Australian vet Lynn Simpson, who served as the official on-board vet for 57 live export journeys, including to Israel. 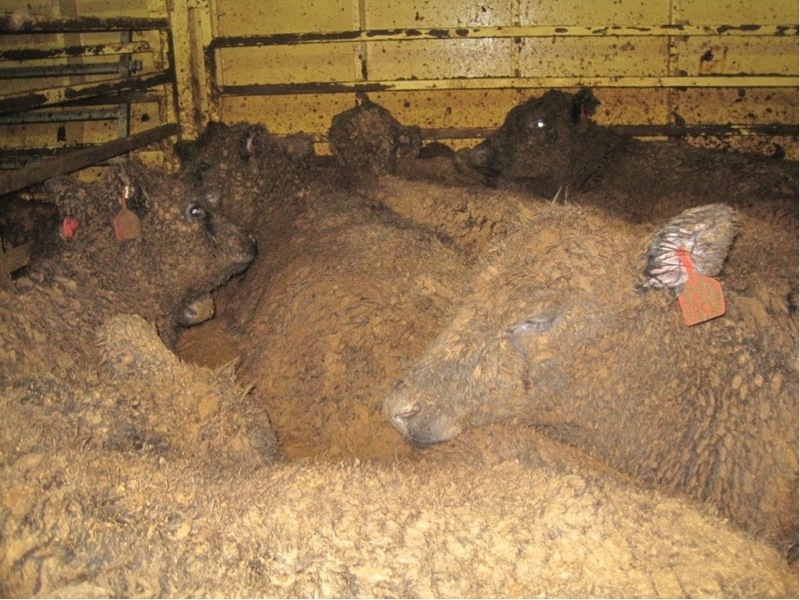 Simpson submitted a harsh, confidential report on live shipments to an Australian government steering committee in late 2012. The department accidentally uploaded the report to its website, and weeks later, Simpson was fired, on the grounds — according to the Australian Broadcasting Company — that the livestock industry did not want to work with her anymore. Simpson had reported that the space given to each animal was so small that the animals could not lie down and rest. Those that could were often smothered or trampled. 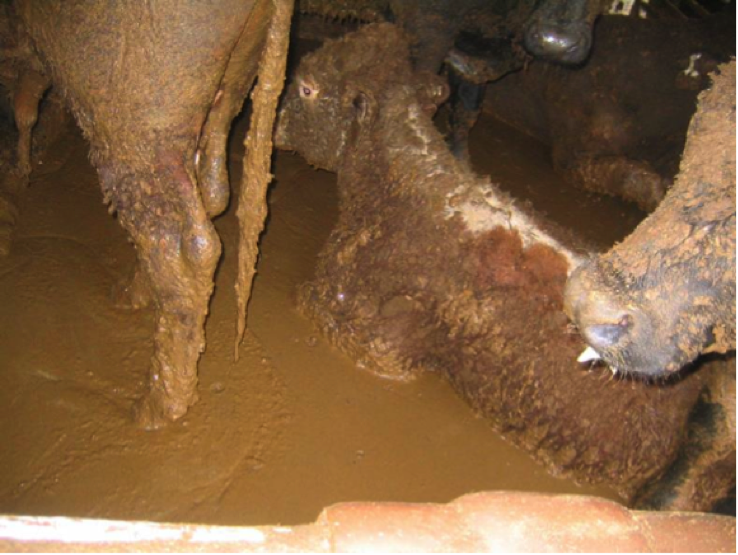 Many cattle suffered serious leg problems as the result of standing for long periods on bare metal or bitumen decks. 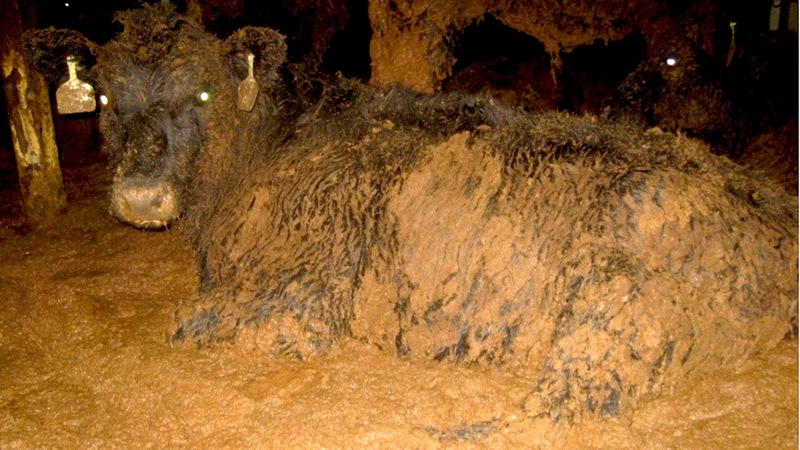 Photographs she took showed animals covered in excrement. During one passage, freezing waves threw sheep around like “rag dolls.” Thousands were suffocated under others and hundreds died of hypothermia within hours. “There have been no changes in the guidelines since Simpson was fired,” lawyer Yossi Wolfson, representing the animal rights groups before the Supreme Court, told The Times of Israel. If in the past, high Israeli import taxes and stringent limits on the quantity of imported chilled meat made live exports – which started in the 1990’s — more economically competitive, import tax cuts and the opening of the meat market to Poland and Latin America last year changed the rules of the game, he said. And if chilled meat slaughtered in Israel stayed on supermarket shelves for six weeks, sometimes even longer, it could be shipped the three weeks to Israel from Australia, Wolfson added. A statement from Israel’s Ministry of Agriculture said a ministry supervisor or a government vet had to be present at the arrival of every shipment to check the consignment, the state of the animals, the conditions of the ship (most shipments are by sea) or the airplane and the unloading conditions. If defects are discovered in the consignment, the ministry turns for clarification to the authorities in the exporting countries. 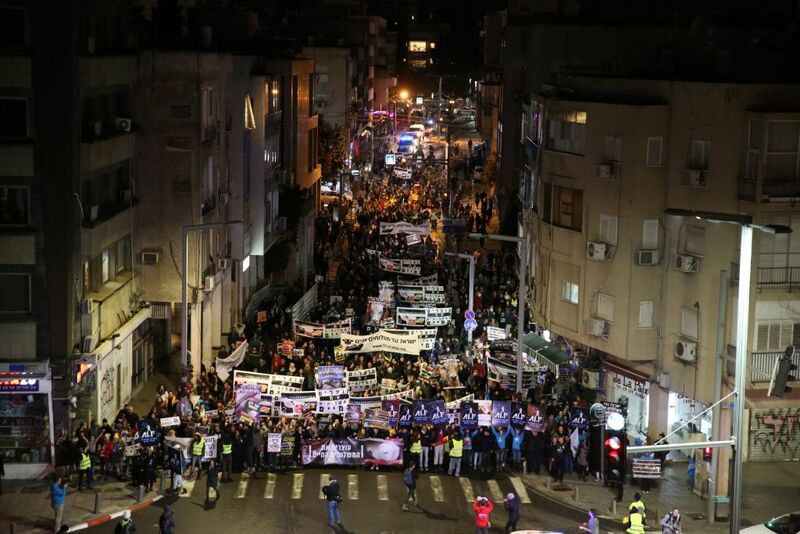 In addition, the ministry was working to increase the import of meat to Israel, which would certainly lead to a reduction in shipments of live calves, the statement went on. Officials were looking into the possibility of extending the shelf life of imported chilled meat so that imports from South American and other countries could be increased and chilled meat prices bought down. 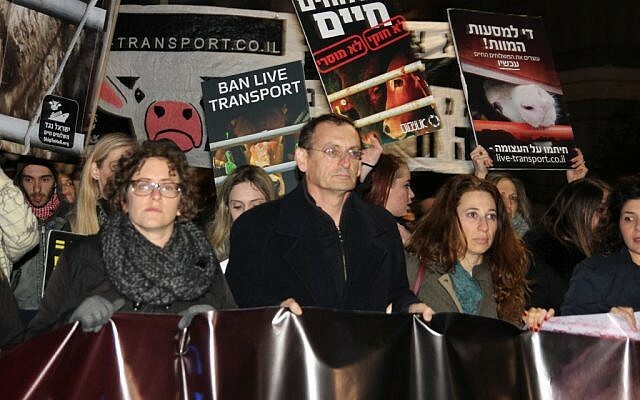 Furthermore, the statement said, the ministry had pushed for approval of regulations for the transport of animals within Israel, which include reducing transport time as well as providing shelter from rain, ventilation, cooling and relief from overcrowding. “The ministry calls on the public to report any suspicion of animal cruelty,” the statement concluded. 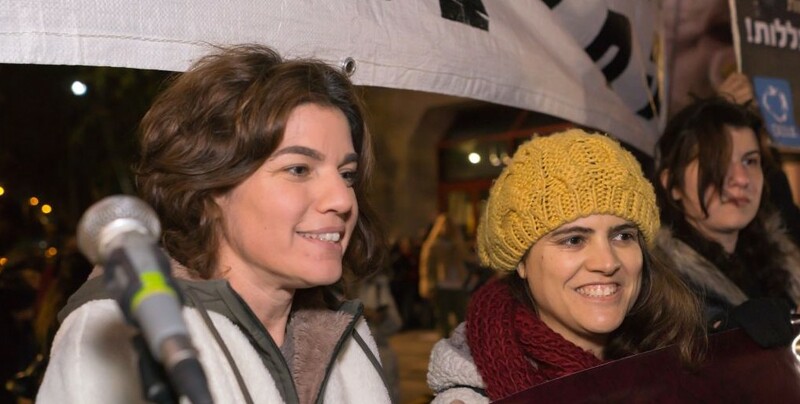 Two years ago, lawmakers Tamar Zandberg (Meretz) and Miki Zohar (Likud) proposed legislation to halt the shipments and submitted it for a vote in July, when Agriculture Minister Uri Ariel (Jewish Home) asked them to wait and to let him try to bring the numbers of live shipment animals down.